A rumoured handset, the LG Doubleplay (rumoured as the Flip II) has been spotted again sporting a small display which divides the QWERTY-keyboard. 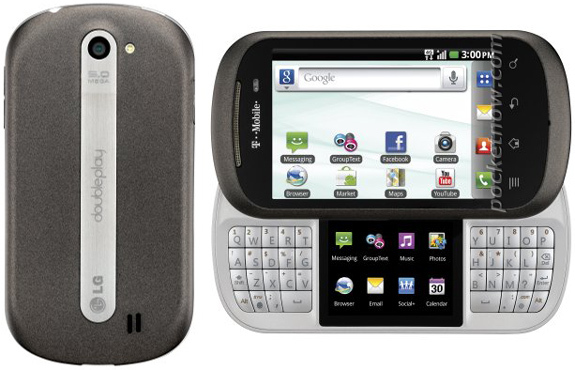 This time the handset has been spotted with a T-Mobile logo which suggests that it will be US-first launch. The main display is said to have a 320×480 HVGA resolution. Other rumoured specs include a 5 MP camera at the back and Android 2.3. Doubleplay will be launching on 2nd November for $150 on contract.The handset surely has a new design perspective, but I personally think that the secondary display is just a trying-real-hard effort by LG to get some attention. What do you think ?